WASHINGTON (Feb. 1, 2017)—The number of charges related to the Islamic State group issued in the United States since March 2014 increased from 113 to 114, according to updated research from the George Washington University’s Program on Extremism. The research, released Tuesday, names one individual identified in January, following two new cases in December. According to the latest analysis of cases, the average age of charged individuals was 27, arrests occurred in 26 states and the average prison sentence was 13.1 years. Additionally, 46 percent of those charged were accused of traveling or attempting to travel abroad, 30 percent were accused of plotting domestic terror attacks and 59 percent were arrested in an operation involving an informant and/or an undercover agent. The researchers also found that 64 individuals have pleaded or were found guilty in the U.S. legal system. Of the 114 cases, researchers identified 88 American citizens and 10 permanent residents who had been charged. 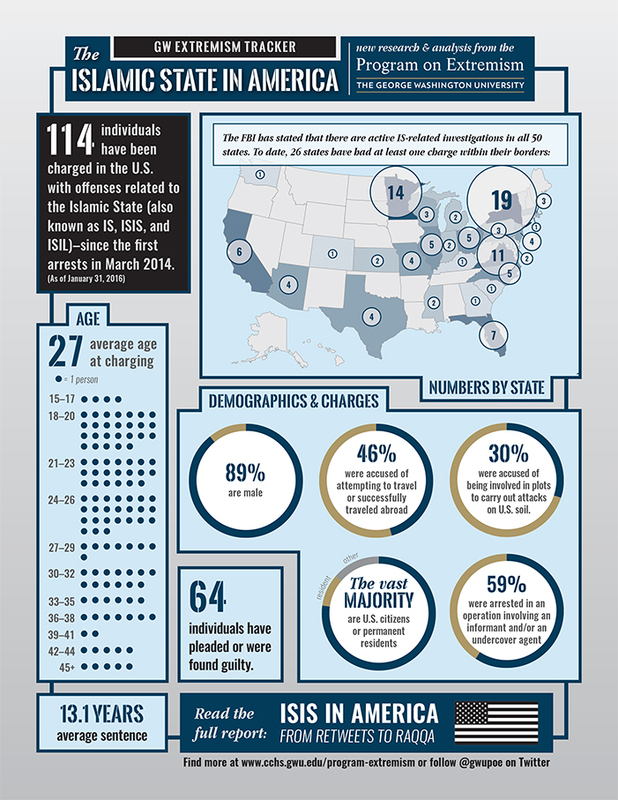 The GW Extremism Tracker compiles research in a series of monthly updates produced by the Program on Extremism, following a first-of-its-kind report that offered the most extensive examination to date of Americans arrested for supporting IS. The organization also collected and shared more than 8,000 legal documents related to the arrests. • Click here for an infographic on terrorism legal proceedings and attacks in January.